"It's midnight. You're standing in the middle of a remote desert in Central Asia, surrounded by over a million lights, and you just think 'Wow'." The world record for the largest light picture using LEDs has been smashed using over a million lights spread across over three quarters of a million square meters - the equivalent of approximately one hundred full-sized soccer pitches. 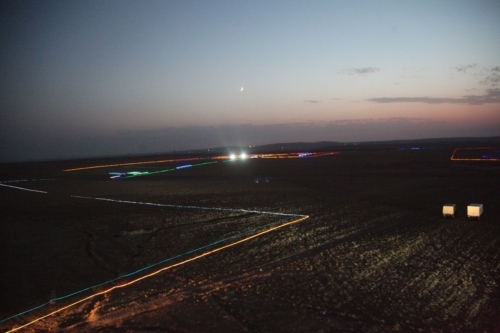 The successful attempt broke the previous record of 50,010 lights. 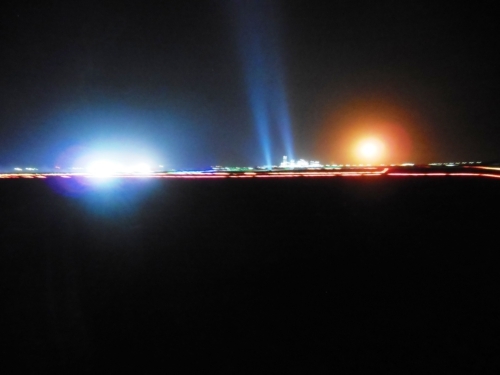 The light picture, a full scale plan of an energy plant, used 1,012,840 lights and needed twenty four kilometres of lighting cables, fourteen kilometres of power cables and 302 kilowatts of power from three generators, a railway station and a nearby gas plant. "The perfect marriage of engineering, technology and creativity." The new record was set at Shurtan in southern Uzbekistan as part of the naming ceremony for OLTIN YO'L GTL, a joint venture to make high performance, low emissions fuels. "We wanted to celebrate so we created a full-sized image of the plant layout. Our plant will set new standards for clean fuels so it's great to be "OLTIN YO'L - the record breaker" right from the start. "We did what we set out to do, on time and safely - that sets the standard for us going forward." "For six days, we worked round the clock in temperatures of over forty degrees, in thirty kilometre plus winds. It was like building a fairyland for very tough fairies."